Doing the right thing. Through anything and everything. Even if it hurts so much it's almost unbearable. Even through the darkest of situations... like loosing a child. Or in Denise's (Neisha Stone) case, loosing a son. It was all so senseless and out of her control. Wrong place, wrong time. Hardly a comfort when dealing with the loss of a 10 year old. Especially when it's a shooting we're talking about. A bullet meant to be from one criminal to another. How do you deal with that? For Denise the answer is as simple as it is painful. You get revenge. For a black ops agent, former, revenge is definitely a dish she's able to serve. But should she? As her hunt for those responsible escalates with the help of a mysterious stranger, via text messages. Denise is forced to either give in to the hate and destroy those she deems responsible. Or, let the justice system take over and do what her moral compass is longing for. No matter what, her son is not coming back. It's all comes down to degrees of payment in Chris Carters flick. And as the title would suggest... revenge. So let me just get right into it. The Black Revenger has a lot of good points, but also visibly showcases a green and budding director. There will be no mistaking this title as a micro budget indie flick. The first thing I noticed was the lack of the main plot... all the way up until almost the second act. For a film with a combined length of under 70 minutes, it was definitely noticed, that the main story arc didn't happen for almost 20 minutes. This is when Denis's son is shot. All that came before it felt like a really long montage. Most of it not needed. Most movies have the protagonists justification happen rather quickly. Not a third of the way into the film. Speaking of montages, another thing that stood out like a sore thumb was the use of stock footage. A lot of it. Generally speaking, stock footage is a great resource. Except when it looks so damn good... that it looks nothing like the movie footage itself. Adding to the glaring use of stock footage, is a frame rate issue that kept reappearing within the film. A stutter almost. The goal of any film is to keep the viewer immersed within the world of the movie; sometimes that means having to 'dumb down' the stock footage if you want to use it... and solve frame rate issues. Other than that? The expected audio issues were present. Wind noise, etc. I also noticed that at times the background scoring was so loud it was hard to hear the dialog. Again, all expected. Not a major issue - but the real thing about The Black Revenger is this. The entire movie could probably have been done as a short film. Cut out the massive amounts of news clips, establishing shots and stock footage - and only put in what moves the story forward. Chris Carter's film 'probably' could have been told in a half hour or under - and that would have kept the pacing meaningful and tight. Now the good stuff. The leading cast all played their parts quite well. Especially for a micro budget film. 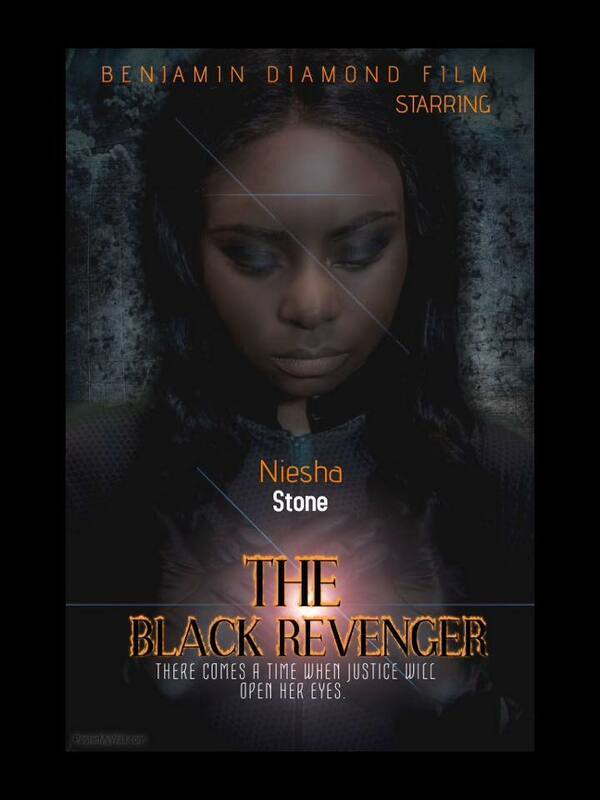 Neisha Stone and David Steven Perez, as the main baddie, all did wonders with their parts. But a special shout-out goes to the mad scientist of sorts. I really don't think his name is ever revealed - but you know who you are. Small-ish role? Yes. Memorable? Very. It's very impressive that Chris Carter and his troupe have made a micro budget film... that is actually watchable. I've seen so many indie movies, that were definitely 'not' the directors first romp in the park... and even had small budgets to work with... that were completely unwatchable. Not the case here. Although this title looks indie, that doesn't make it not worth the time. It's not perfect... but what is? If it's all about respect than the cast and crew here have earned mine. Everyone who helped make this movie a reality should be praised. I truly hope Chris keeps the ball rolling... because I can't wait to see what the future holds - once a little more experience is gained.